This red-brick building dates back almost to the founding of the town (in 1817). It began its service to the Mt. 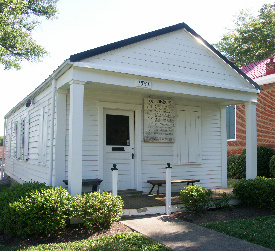 Healthy community in 1825 as the Free Meeting House, hosting the congregations of various religious denominations. After separate churches were constructed, the Meeting House was used as the seat of the Village Council, and at one time also contained the town jail. Moved to its current location and refurbished in 1966, it currently serves as the main exhibition space for the Mt. Healthy Historical Society. The little white clapboard tollhouse was built in 1859. It originally sat along what is now Hamilton Avenue, which was at that time the Cincinnati and Hamilton Turnpike, connecting the cities of Cincinnati and Hamilton. All who wished to pass through the village on the turnpike were charged based on the size of their vehicle or the number of horses, mules, cattle, or sheep being transported. 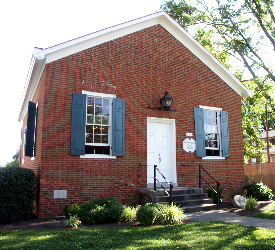 When the building was moved to its present location, it joined the Meeting House as part of the Historical Society complex. For research appointments, please give the Society advance notice so that the needed information (if available) can be ready for you.